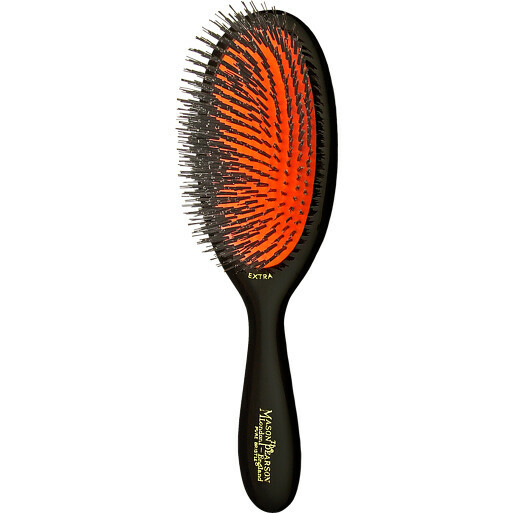 This boar bristle brush is best for fine hair, with 7 rings of extra stiff pure bristle tufts to stimulate blood flow to the hair roots. The density of the bristles allows conditioning sebum to be more evenly distributed from the roots to the ends of the hair. Mason Pearson Brushes Pure Bristle Extra Small is rated 5.0 out of 5 by 3. Rated 5 out of 5 by iamsophiemona from Amazing! I can't believe I did without this before! This brush is simply a must-have and knowing that it's something you use everyday makes it a blessing to your hair. The first use feels like magic! I have thin curly hair (you can check me on Instagram @iamsophiemona) and I felt my tips were very dry and damaged. Using this brush, my hair is now healthy! Amazing! Even my husband noticed my hair changed to feel like silk. Thank you so much Mason Pearson! Rated 5 out of 5 by Liz16 from Brilliant This is the best make of brush I have ever used. It really gets right down to the scalp without being too 'harsh' It has a nice size handle for holding and you get a good grip. Bought this to replace a nylon and bristle brush I purchased several years ago. Rated 5 out of 5 by kitty from I have been a proud owner of a Mason & Pearson hairbrush for over twenty five years and as you may appreciate after the constant daily use over that amount of time the brush cried out for a replacement.My husband ordered the exact same model via the internet yesterday and also phoned your department to speak with an extremely helpful gentleman who confirmed all the relevant details.This morning I am again the proud recipient of a brand new hairbrush and it was presented in the same old unique box as when I last bought one 25yrs ago.It glides through my exceptionally long fine hair with the greatest of ease.The brush massages my scalp and gently untangles knots without damaging any strand like the majority of other so called hairbrushes.I would highly recommend this hairbrush to any one who is considering a new brush;it combines supberb brushing of or hair,massages your scalp,remains to have the customer satisfaction as the quality of the product is second to none......and definitely fantastic value for money.